This quote has been one of my favorites since high school. It is terribly easy to get locked into a routine. Sticking to a schedule can be extremely healthy. I love when I am on a streak of waking up early everyday, making my coffee, cooking breakfast, and walking the dog. It makes me feel accomplished. However, when you add a 9-5 job, house cleaning, errands, watching tv, cruising the internet, and a social life, it is all to common to turn on auto-pilot. I have gone through periods of time where I am simply going through the motions. Most of the time it is when work becomes stressful and all of my responsibilities seem to be consuming my days. Before I know it, a couple weeks have passed and I have trouble remembering what I did each day because they all blend together in a blur. Each day was the same as the day before and I realize I am in over my head with the mundane. A sure way to shut down auto-pilot and switch into a manual gear is to try something different. Break away from your normal routine and secure way of living life and learn a new skill. Crave the uncomfortable. A year ago I took my big sister, Natalia, on an adventure in beekeeper school. We drove my '84 Mercedes into the gorgeous Watsonville hills with the sunroof open, the windows down, and Amy Winehouse on the speakers. 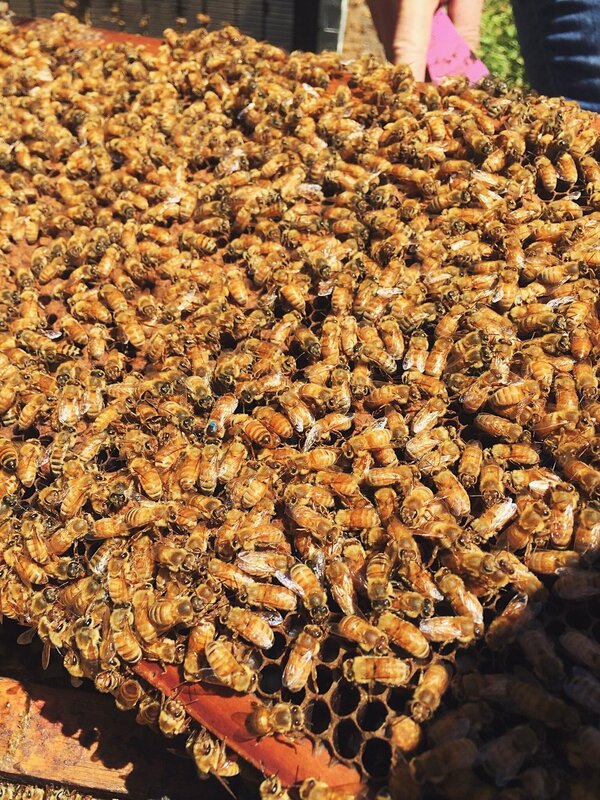 Our destination, Pacific Crest Apiaries, is quick 30 minute drive from my house in Santa Cruz. The beekeeper school only cost $35! Learning something new doesn't have to be expensive or time consuming. The class lasted a few hours on a Saturday in April 2016 and I left with so much information and resources. I also completed the class with a newfound passion and love for the beauty of honeybees. Dana Mumm, the owner of Pacific Crest Apiaries, is a talented beekeeper and amazing teacher. She had enough beekeeper suits for all the students and everyone had a chance to interact with the hives. She has a beautiful gift store that is open year round which carries her delcious honey as well as homemade candles and artisan crafts. Dana hosts a variety of workshops throughout the year such as beeswax candle-making courses and how to ferment jun, a honey-based kombucha. The shop and farm are super close to one of my favorite Mexican joints, El Azteca. Their homemade horchata and chile relleno is delicious. I highly recommend making a trip out there. Across the street from the El Azteca is a beautiful nursery so you can pick up some plants as well. Throughout the class, I got more and more comfortable with the bees to the point where I took off my entire beekeeper suit, including the protective hat. Although it was intimidating at first, I developed more confidence in myself. I saw that Dana was simply wearing jeans and a t-shirt so that inspired me to get out of my comfort zone. Is there anything new you have been meaning to try? I've always loved bees and I figured it was time for me to interact with them. I just Googled "beekeeping school" and called a bunch of places in my area. I did about 30 minutes of research before I found out about the class. You can do anything you set your mind to. Don't wait for the opportunity to present itself, sometimes you have to create your own opportunities. Your mind and soul will thank you. If you are interested in beekeeping, Google your city along with "apiaries." Another great resource has been the book, Honey Bee Hobbyist by Norman Gary, PhD. Here are some snapshots of beekeeper school. We had a magical time and the photos prove just that. My face in the photo below is ridiculous. I usually only look at food that way. We took turns lifting out the frames of the hives searching for the Queen Bee to make sure she is happy. My sister and I rocked zero gloves and no suits. There are full suits available if you're interested in taking Dana's class. Be sure to bring gloves if you are scared. It is easier to wiggle the frames out of the hive without gloves, however. Bees are intuitive. I swear, they pick up on vibes. My sister and I each made friends with a bee. Neither of us were stung. No one was stung the entire class. I felt so comfortable with the bees that the mask had to come off. I love the picture above! There are bees flying everywhere. There are many hives at Pacific Crest Apiaries. All of them have little jars of sugar water for the honeybees to eat. Natalia and I usually wear all black. Bees don't like dark colors though! We made sure to wear light clothing. We had an incredible time at the apiaries. Not only did we learn everything we need to know to have our own hives. We stocked up on local handmade candles, a couple pounds of bee pollen, and delicious honey. The next skill I want to learn is horseback riding. This is definitely going to cost more than beekeeper school. I've been saving up, though. There are so many other workshops out there that don't cost much money such as succulent potting or macrame workshops at local nurseries. Yoga teacher training was a big investment for me, but I will carry those skills for a lifetime. Currently I am enrolled free classes through Coursera. I am studying Intro to Marketing from an Ivy League business school as well as Intro to Public Speaking from University of Washington. I received full scholarships for both these courses. LinkedIn and Coursera are integrated so you are able to post your verified accomplishments on your page. There is never a reason to stop learning. Challenge yourself. Practice discipline and try something new.